A disabled man has become the first to sail halfway around the world - literally SINGLE HANDED. Brave Keith White, 67, set off on his solo voyage across the globe in October and returned to England last week. But his achievement was made all the more remarkable as the father-of-four did it all with just one hand - having lost use of his left arm in a car accident back in 1991. In completing the 5,000 mile trip, he claims to be the first disabled person to complete a trip across the Atlantic without any help or support. He was lucky to survive the 14-car pile up, but says he has been in constant pain due to the nerve damage and ever since has never regained full use of some of his limbs. The sailing fanatic, who lives on the Isle of Wight, set off from Dartmouth, for his eight month voyage which took him him to far-flung places including Brazil and Sierra Leone, and the Cayman Islands. 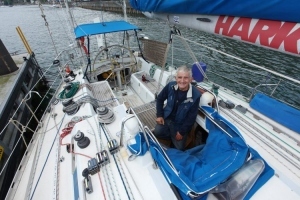 Keith, a former electrical engineer who also has eight grandchildren, said: "It's quite an achievement being the only person to have sailed across the Atlantic with one arm. "A lot of people may claim to have done it single-handed - but no-one has literally done it until now. "I'm the first disabled person to do so and I am very proud of that." Keith, whose wife Kathy died three years ago at the age of 47, said his journey was not without its challenges. He added: "There were so many storms on the way back - I hit five major ones, all over force 10. "Two were over force 12. "This boat is the safest boat I have ever known though - I wasn't particularly worried." "I did have a big fright at one stage when I ran out of tea bags though," he added. Keith's passion for sailing began when he was 16, and he has other achievements under his belt - having become the first disabled person to sail around Britain in 2005. For this feat, the circumnavigation attempt was supposed to be a non-stop journey - but after experiencing a gear failure he had to head to a port in northern Spain for repairs. He continued to Sierra Leone where he had more troubles and went to Brazil before sailing to the Cayman Islands where he paused over the winter on November 8. But he resumed in April, non-stop to Dartmouth, and became the only disabled person to have completed the longest non-stop trip across the Atlantic to Britain. He returned from his 4,800-mile journey on June 13. "At times it was horrendous," he said. "It was the worst season the Atlantic had seen in a long time, I was told. "In between the Bahamas I was just using a jib and sail and just after Bermuda the engine packed up. "Not to mention all the storms. "I didn't know where I was going to end up." "It's all an adventure though," he added. "I was upset when I got back to the UK because the adventure was over but there was also a bit of relief, it's hard to explain." Brave Keith didn't have any sponsors and used his own money to fund the trip until just before he set up when Henri Lloyd sponsored him for clothes. The journey was to raise money for two charities, Save the Children, and a foundation to build a sailing replica of the Cutty Sark. He will continue his passion on his home of the Isle of Wight when he returns from Dartmouth. "It occupies most of my time," he said. "It's good to keep myself busy and I look forward to embarking on my next adventure." Keith says sailing has been his remedy ever since he became disabled following a car crash 25 years ago. He said: "In 1991 I was the passenger in a car that was involved in a 14-car pile up. I died for over 20 minutes and had a burst lung. "It was only because I was super fit that they kept me alive. I was given pain killers and the doctor said I would live for just 5 years. "That was 25 years ago. I stopped taking the pain killers and suddenly I could talk again. Sailing helps take away all the tension of the pain."